10/ Road resurfacing - Main road through village and Whitefield Road. The vision is to restore the old and poorly maintained buildings and make them suitable for holiday and fishing accommodation. This will be done in a sensitive way so that where ever possible the original character of the area is protected. 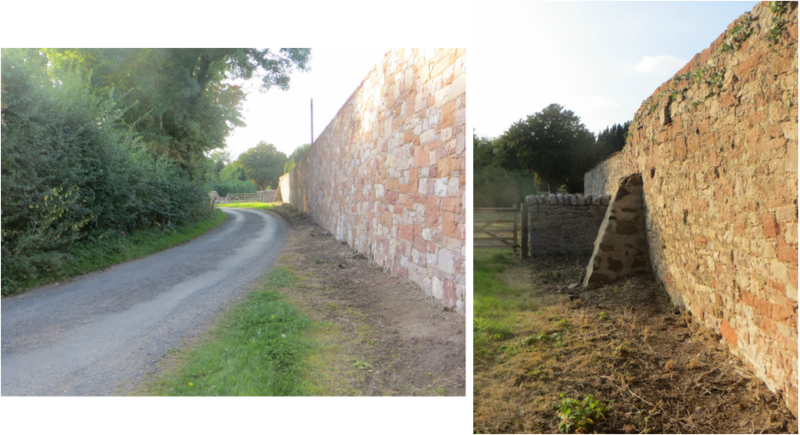 The over grown ivy on the stone walls needed to be removed and taken back to the original state for inspection, strengthening, repointing and in some places a complete rebuild is necessary. Whilst the owner is carrying out major restoration work on the Walled Garden walls he advises that he has no plans to build houses or a bridge across the river for access which had been a rumour in the village. In fact he wishes to protect the country side view from his Monksford House residence which overlooks the Walled Garden and houses would spoil this. The ’listed’ gate to the Walled Garden is to be given some TLC with weeds coming from the mortar being removed and stone work being checked out. The ‘right of way ‘ immediately next to the Three Muses Temple will be cleared of builders rubble, the Fishing Hut, which belongs, to another person will be move further up stream above the Temple and a new vehicle track with a pedestrian gate accessing the ˜right of way’ and a sign post will be installed. SBC are happy with these planned changes which are all on private land. It is understood that the recent lack of grass cutting along both the north and south river banks making it difficult to use the paths, the moving of a memorial seat down stream together with the repositioning of the Fishing Hut further up stream is connected to another person after a change of ownership of the river bank fishing beats. The missing memorial seat has in fact been moved further down the river on the Dryburgh South Beat which has, it is said, the deceased family’s full agreement. A site visit took place with the Council Access Officer who confirmed that a company was contracted to cut grass on the ‘right of way’ path set back from river bank on the south side of the river three times during summer. However this did not include the path immediately on the river bank. In the past this had been done by the owner of the fishing beat but stopped when the ownership changed. However the Access Officer has agreed that the contractor would be instructed to do at least one of the three cuts along the south river bank path in the future.